Trade shows can be an effective way for small businesses to publicise their brand, connect with their target audience in person, and generate leads to grow their company. Exhibiting at an event can, however, cost a lot of money and time. That’s why it’s crucial to plan, prepare, and ensure that your next trade show exhibition is worth every penny. In this article, you’ll discover the steps you need to take to ensure you’re 100% prepared, so you avoid the common trade show sins and maximize your ROI. In order to maximise your trade show success, it’s crucial that you prepare yourself and your staff. A predetermined, well-thought-out goal will not only provide the basis for your marketing strategy, but it’ll also give you a yardstick with which you can measure your success. If you’re wishing to generate more leads, decide on a precise figure. If you exceed your goal, great. You’re doing something right. If you fall short, you know there’s room for improvement. This information can be used to improve and perfect your future marketing strategies. You must be clear about what you need to achieve to make your participation in the show worthwhile. If it’s generating new leads, measures like pre-ordering business cards, creating an attractive exhibition design and having brochures on hand to offer will better the chances of you crushing your goals. Before you sign your company up to attend a trade show, it’s vital that you conduct thorough research into the show you’re attending. If you’re trying to generate on-site sales amidst dozens of others offering similar products, you’re likely to be driven out of the market by competition. Choose a show where competition is as scarce as possible. What are your participation goals? Do you want to generate more leads? Sell more products? Network with similar businesses? The show you choose to attend should be specific to these goals. If you’re selling a product or service locally, hosting a trade show in another state is unlikely to provide any return on investment. Choose your location wisely. Trade shows attract thousands of attendees each with differing interests. That’s why it’s crucial that you have a target audience in mind and that you tailor your strategy to that audience. Lists of exhibition attendees can often be purchase from the show’s host, these giving you an accurate idea of the types of people that you’ll be targeting. Find out who’s attending your chosen trade show, whether that be CEOs, startups or sole practitioners. If your target audience is likely to be there, great. If it’s not, perhaps you need to reconsider your choice. Marketing to the wrong audience is unlikely to yield any positive results. That’s why it’s key that you host your exhibition at a trade show that your demographic is likely to attend. While size matters, spending your entire budget on the biggest, most spacious area of a trade show is unwise and will severely harm your return on investment. Equally, if you’re advertising a lot of products or have several representatives, you’ll need to make space for them. It’s important to consider exactly how much space is necessary for your exhibition. If you can’t afford a huge footprint on the trading floor, fear not. The key to trade show success isn’t nearly as much the size of an exhibition as it is the quality of it. 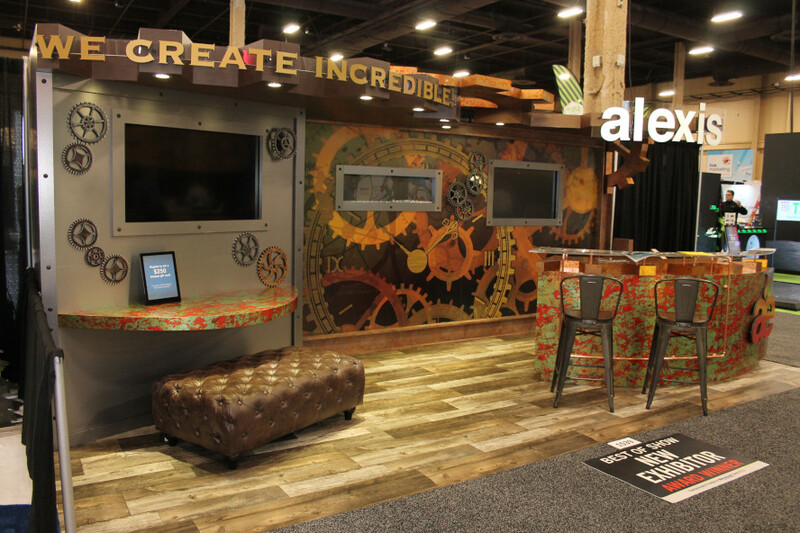 If you can’t leave a meaningful impression on visitors at a smaller booth, making it bigger won’t change a thing. How well you prepare is one of the determining factors in the success of your trade show participation. Preparing well will not only save you valuable time, but a considerable amount of money, too. Signing up within 30/60 days of the event, for example, can reward you with discounted rates, freeing up more of your budget to spend on your exhibition. Additionally, ensure that you have all of the equipment necessary for your exhibition. If you forget anything, it can cost a lot to hire items, delivery often incurring expensive extra fees. You should also make sure that any business cards and other branded giveaways (eg. pens, tote bags and brochures) are purchases and prepared long before the day of your show. So long as you have a budget and a timeline in mind, you’re unlikely to make expensive mistakes. By planning out the day’s events, you can ensure that all needs are met for your trade show exhibition. Factors like time spent commuting, staff breaks and how long it will take to set up and pack down should be taken into account. These can come as unexpected hindrances to the efficiency of your show if you don’t create a timeline beforehand. If you’re arriving and leaving at peak times, for example, factoring in rush hour traffic will stop your staff from showing up late. Deciding on the best times to hold demonstrations and display promotional videos will ensure that your advertisements have a wider reach. Mapping these events on a structured timeline, you can rest assured knowing that everything is under control. It’s prudent to spread the word that you’re participating in a trade show beforehand. You may have the greatest, most efficient and affordable new product to sell. But if nobody knows about it, nobody will be buying it. Inviting clients, customers, suppliers, and any other useful contacts along to the show is a great way not only to generate more leads, but more people will be intrigued by your exhibition if it’s attracting a lot of interest. Ensure that you give out your booth number and any relevant details, whether via direct contact, social media outlets or through your website. Purchasing an attendee list can provide a sound basis on which to formulate a marketing plan. If you know who’s attending, you can target your strategies to interest the right customers. Trade shows are competitive environments. Amidst an abundance of other stalls, several of which are likely to be similar to your own, you have to stand out. Visuals are everything when it comes to grabbing people’s attention. You can have the most skilled staff, excellent customer service and an incredible product, but if your stall isn’t attractive, nobody will notice it. Get your message across without overloading people. Short, sharp sentences that deliver quality information in as few words as possible will keep people engaged. Competition is fierce. If you want people to approach your stall and invite you to share more information about your business, you have to make yourself noticeable. Granted, an attractive stall will take time not only to design, but also to construct. Ease-of-use, however, should not be the determining factor. If your exhibit is bland and dull, there isn’t much point in it being there. It won’t attract any attendees. If your goal is to drive product sales, design your stall with this in mind. Your aims should form the basis of your every decision. Critical to developing strong connections with visitors, the staff that you choose to work your exhibition should be engaging, enthusiastic and passionate about your business. Your employees are vital to the success of your exhibition. Engaging and exciting conversations will leave a lasting impression in visitors’ minds, presenting your company in a positive light that encourages leads, sales and connections. As important as speech is, there are many other effective ways to draw people into your exhibition. Interactive demonstrations, motion graphics, and live videos are all elaborate ways to spark an interest in passersby and drive traffic to your booth. These should be planned and considered long before the day of the show. Your post-show activity is crucial to the success of your movements on the day. You’re likely to generate leads and customers at the show, and if you don’t respond to these people quickly and efficiently, they’ll soon find another business to fulfil their needs. That’s why your post-show plan is the crux of your trade show success. Engaging with those interested immediatelyafter the show will keep people interested and leave a lasting impression in their minds about your business. Additionally, it’s wise to set up a post-show debrief meeting with your sales and marketing teams. The purpose of this is to discuss your successes and failures – what worked, what didn’t, and how you can use this information to maximise your future marketing success. As important as it is to cover your bases before attending a trade show, it all comes down to how your business performs on the day of the event. Once you’ve jumped the hurdle of getting people to come to your booth, you then face the next challenge: keeping them engaged. Confidence and professionalism are two key weapons that every exhibitionist should have under their belt. A friendly, enthusiastic, warm welcome should be given to all of your customers. Make them feel appreciated, without coming across as fake and salesy. A firm handshake, kind smile and your undivided attention will not only create a great first impression, but will make people want to stick around to hear more about your business. Your goal is to draw people in without intimidating or overwhelming them. We all love to talk about our own lives. But, you don’t want to be on the receiving end of an unsolicited barrage of business jargon, unable to fit a word in edgewise. Taking interest in others and talking about them is a much better way. People don’t want to be bombarded with information that they didn’t ask to hear. They want to know what’s in it for them. That’s why it’s crucial that you listen well and invite your visitors to talk about what interests them. Where are they from? What attracted them to the stall? What intrigues them about your business? Keep the conversation about them. Even when you’re sharing business information, make it personal to the individual you’re speaking with. Your uber-protective, carbon fiber phone case with an inbuilt WiFi signal may well be a revolutionary product better than any competitors’, but what does this mean to the middle-aged mother you’re trying to sell it to? Keep it personal; tell your visitors what’s in it for them. Your physical stance can speak a thousand words. Mimic with your body the impression you wish to make. Be open, friendly, confident. Avoid standing with your arms folded or in your pockets and maintain eye contact when engaging with visitors. A confident exterior reflects faith in your business. If you give the impression that you believe in your company, others will too. All too often, exhibitors will remained seated behind their tables, visitors being forced to stand up and look down at their speech partner. Not only is it an uncomfortable way to hold a conversation, but it isn’t engaging in the slightest. Stand up, shake your visitor’s hand and keep your body moving to maintain interest and engagement. Brief, non-intrusive and friendly physical contact is a powerful way to make another person feel liked and at ease. If at any point during the trade show you or another director is absent, it is imperative that you deploy a representative armed with expert knowledge of your company. Oftentimes, new employees are sent to trade shows by employers as a method of gaining valuable marketing experience. While this isn’t necessarily a bad idea, it’s unwise to leave these trainees with the responsibility of delivering information and driving sales alone. Rookies should be assisted. They should indeed be allowed to learn in a realistic environment, but certainly not at the expensive of your business’s profits. Make sure that your exhibition booth is always manned by a representative that knows they’re stuff. Inexperienced colleagues will make your business seem messy and your staff poorly-trained, neither of which will persuade visitors to spend money on your company. Preparing your booth and staff is, indeed, a top priority, but it’s crucial that you take measures to also prepare yourself for your exhibition. Trade shows are long days, often chaotic, and without a doubt stressful. If you aren’t prepared, you won’t be capable of performing at your best. Seems extreme, but trade shows can get brutal and intense. Equipment like first aid kits and portable chargers are a must. Small, seemingly insignificant items like these can make or break your exhibits success. You’re likely to be on your feet all day at the trade show meeting and greeting attendees. It’s critical that you come equipped with shoes that are both comfortable and professional. The first impression that you create upon visitors to your exhibition are incredibly important. While a full suit and tie may not be wholly appropriate (and a little intimidating), a smart, clean and ironed outfit is a must. As we discussed earlier, your post-show activity is critical to generating successful leads. The most important element of this is following up promptly with any connections you made at the show. Avoid being overly pushy and salesy. You’ve gained a person’s interest and the last thing you want to do is scare them away by flooding their inbox with sales pitches. It was great to meet you at [the name of the show you attended] yesterday afternoon. Thank you for expressing an interest in [your business name]. If you’d like any more information about [product/offer/service – be specific], do let us know and we’d be more than happy to provide this. It’s personal, it’s friendly, and it doesn’t feel like you’re trying to sell something. And that’s the key. Nobody is going to want to give you money, sign up to your newsletter or invest in your business because you keep asking them to. You have to make them want to do it. Visitors at trade shows are subject to hundreds of conversations, innumerable attempts to be willed into spending money, and a diverse range of business ideas. Even if an attendee likes your product, unless you make it memorable, they’re likely to forget it as soon as they leave the show. Exhibitors running popular booths are excellent at customer service. It’s what they’re trained to do. Every trade-show expert understands just how important it is to stock up on promotional materials to give out to interested attendees. These are great for two reasons: not only is such a gesture likely to paint your business in a positive light, but each visitor will be taking away with them a reminder of your company’s name. Your promo-stock should be high-quality, organised, and, most importantly, branded effectively, the name of your business printed clearly. Amidst the many things that you should be doing, there are a handful of trade show sins that you should steer clear of. It’s easy to get caught up in delivering a highly-persuasive and engaging speech to every attendee you meet – but this isn’t always the best idea. You have to keep things simple. Clarity is far more important than being persuasive. People aren’t going to visit your stall because they want to be overloaded with information about your coolest feature, most impressive statistics or sales history. They just want to know more about your product. Sure, be engaging and persuasive, but after you’ve covered the basics. Look, there’s definitely a time and a place for aggressive, or more direct response marketing. It’s been proven to work time and time again. But, a trade show is not the time or place. Nobody is interested in replying to unsolicited marketing emails, no attendee is going to be willed into buying into your business because of your aggressive sales tactics. The trick is to be assertive without being aggressive. Aggressive marketers deliver their onslaught of sales techniques without letting their interlocutor leave or fit in a single word or question. They’re eager to share with you the best features of their products, why its perfect for you and how best they can take your payment, all in response to a mere introduction. Arrogance is never attractive. Pass up on sarcastic comments and instead make use of humour without being offensive. Sales-people whom frequently interrupt potential clients are unlikely to succeed in generating leads. While some interruptions may help a conversation to flow, cutting off an attendee as soon as you think of something to say is unwise and a defining feature of aggressive discussion. Assertive sales-people, however, forego the salesy jargon and instead focus on building meaningful connections with potential clients. Convey confidence in a calm and relaxed manner; express self-assurance in your business without being arrogant or intimidating. Be a good listener. Don’t dominate the conversation by interrupting attendees and flooding them with information. Instead, offer honest and clear responses to any questions asked. Use simple sentences. Littering your prose with sales pitches and overly-persuasive language is likely to put people off. Assertive marketers convey their points in a simple and easy-to-understand fashion. When you offer statistics and facts and figures, it’s vital that pass up on the vague statements. ‘A dramatic improvement’ is far less impressive than ‘a 57% improvement in the previous 6 months’. Keeping a list of your business stats on hand will ensure that you can deliver impressive, persuasive information without any fluff. Executing a trade show exhibition can be daunting. But, with the right preparation and planning, taking measures to ensure that your show runs smoothly and efficiently, you can rest assured knowing that you have everything covered.